If you book your wedding with me by January 10th, 2011, you'll receive a complimentary creative bridal session (or trash the dress session) valued at $600! 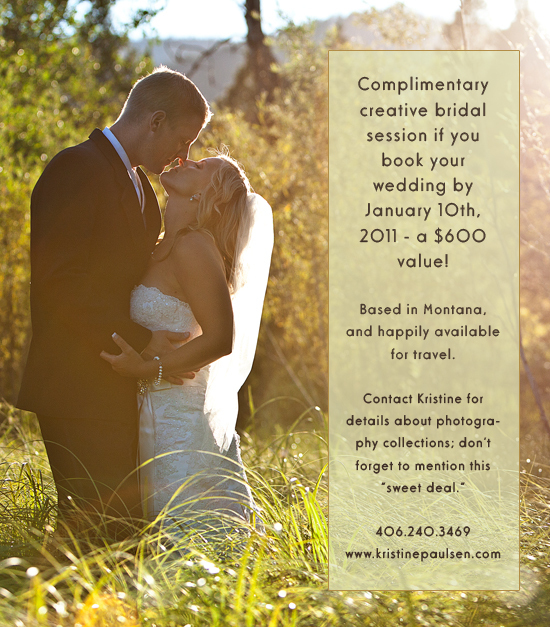 Weddings can be booked in Montana or outside of Montana, as long as travel expenses are covered. If I am traveling to your wedding, your creative bridal session must take place within 2 days of your wedding date, or it can happen later, as long as travel expenses are covered to return to the location of your choosing. Please contact me to learn more about the collections I offer and to either set up a phone or in-person consultation. I look forward to getting to know you and hearing about your wedding day plans!